When was the last time you had a breakfast that made you want to skip lunch? 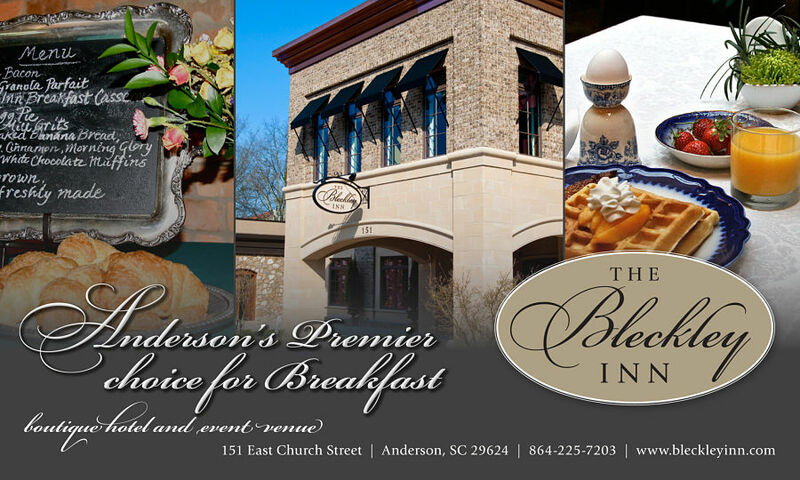 Enjoy one NOW at The Bleckley Inn, provider of the premier Anderson breakfast. Reservations NOT necessary (however, preferred if group exceeds 4 people). If you simply want to grab a cup of the Bleckley Inn special brew; for $3 you can sit in our beautiful dining room and sip to your heart's content! Add $4 more to partake of a delicious yet healthy continental breakfast which features our very own yogurt granola parfait, seasonal fruit selections, and assorted breads and pastries. Finally - don't make lunch plans - enjoy everything listed above plus hot items such as the following: the Bleckley Inn Breakfast Casserole with egg and sausage, and a delicious hashbrown casserole. Our praline bacon is said to be addictive and our grits are from the fabulous local Timms Mill.